It's easily one of the best ways to sample the Wilmington/Newark and Tri-State music scene. When else can you see most of these bands during the day with your family? If you rarely get out to bars and clubs for shows, you'd be crazy to miss it. Even if you do see live music frequently, it's a nice change of pace to see band like The Bullets, The Keefs, and Deadbeatz, Inc. outdoors in the afternoon or early evening. And if you have kids (who get in free if they're under 12), they rarely have the chance to see some of these bands play live. 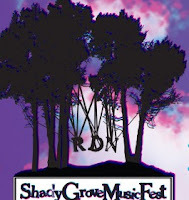 The variety: the 2012 Shady Grove festival featured rock, indie pop, punk, rockabilly, jazz and funk. There's even live visual art, as a festival billboard is painted on site during the event -- in recent years, it has been done by Wilmington graffiti artist 3EYES. It really is shady! The canopy of trees in the grove behind Arden Gild Hall cools off a sunny June day, and even make light rain tolerable. It benefits the Arden Gild Hall, ensuring that the arts in Delaware continues to flourish.